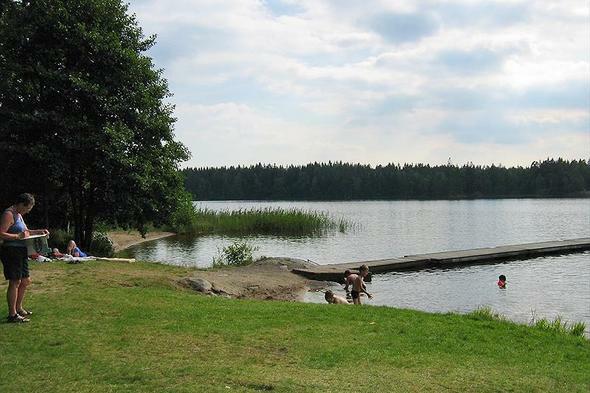 Urshult Camping is a campsite in Urshult, Kronoberg, located in a wood and by a lake/recreational pond.This camp site with sloping grounds has pitches with shade, pitches without shade and pitches with some shade. Urshult Camping is located close to a sandy beach. It is possible to rent hikers' cabins. For sportive holidaymakers the camp site offers various cycle routes. You can swim nearby in in a lake/recreational pond. At Urshult Camping you can go windsurfing and waterskiing. This inspector visits Urshult Camping every year and inspects the campsite on the basis of more than 200 amenities and other points of interest. The inspector is an ACSI staff member and does not work for the campsite. Sehr ungepflegter Platz. Sanitäranlage stark verschmutzt. worden. Sind am nächsten Tag wieder abgereist. Would you like to book Urshult Camping or request more information? You can do both using the information below. Indicated with signs on route 120 (between Ryd and Tingsryd) 2 km direction Sirkön. ACSI Eurocampings will send your information request to "Urshult Camping".